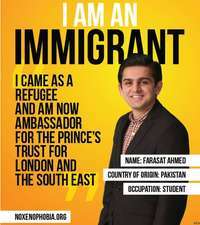 A poster campaign which aims to celebrate immigration, called I am an Immigrant, has been launched. The billboard images have caused a stir on Twitter with one user saying the initiative is great but shouldn’t be needed. 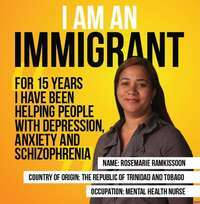 The images show 15 immigrants in different occupations from a barrister to a mental health nurse and a fireman. The campaign was created by Movement Against Xenophobia and funded through a crowd-funding appeal. The posters, taken by Vogue photographer Philip Volkers, will appear in 400 London tube stations and 550 national rail stations and on billboards countrywide after more than £44,000 was raised for the campaign. Habib Rahman, CEO of JCWI on behalf of Movement Against Xenophobia, said: “The extraordinary support we have received from ordinary people shows how fed up many are with the hostility and scapegoating experienced by immigrants. The campaign argues: “Migrants make a substantial contribution to the economy, enrich Britain’s culture and improve the standard of its public services. The Conservative party has yet to respond. LONDON (AP) — An aristocratic Pole has challenged an anti-immigration British politician to a duel. Jan Zylinski, who calls himself a prince, says he’s tired of U.K. Independence Party leader Nigel Farage criticizing eastern European migrants. Poland’s aristocracy was abolished by the former communist regime, but many people from aristocratic families still use their titles. UKIP wants Britain to leave the European Union and deny EU citizens the right to live in the U.K. It is currently running third in opinion polls for Britain’s May 7 election. While the party insists it wants to control rather than end immigration, Farage has said he feels uncomfortable hearing foreign languages spoken widely on London trains, and once blamed immigration for traffic jams. Farage said Monday he did not plan to accept the challenge to a duel. Elva Marroquín and Angel Rosales were lucky to get no-cost attorneys to help them try to keep their children from being deported. Kids without lawyers are more likely to be expelled from the country than children with legal representation, data show. But other parents – many with only a grade-school education and little or no knowledge of English or the U.S. legal system – are left to fend for themselves. More than 100,000 cases involving unaccompanied minors have been filed in immigration court since fiscal 2012, when the surge in the number of Central American children crossing the border began. Marroquín and Rosales found their attorneys, Fernando Romo and Julio Noboa, through ASOSAL, a Los Angeles immigrant-assistance organization that provides free legal services. Marroquín and Rosales said they never would have been able to afford a lawyer on their own. There is other pro bono legal help available to migrants, including services funded with federal and state money. But only a third of unaccompanied minors whose cases were filed in immigration court in fiscal year 2014 had legal representation as of the end of February, according to an analysis of federal data by Syracuse University’s Transactional Records Access Clearinghouse, which tracks immigration-court cases. Children with attorneys are six times more likely to be able to stay in the United States than kids without lawyers, the clearinghouse found. Only 12 percent of unaccompanied minors without attorneys whose cases were filed since October 2011 and decided by February 2015 were given permission to stay at least temporarily. The other 88 percent were ordered to leave. In contrast, courts allowed nearly 76 percent of kids with lawyers to remain in the United States. Those statistics illustrate the unfairness of the government not providing legal representation in immigration court to children whose parents or guardians cannot afford it, said Victor Nieblas, president-elect of the American Immigration Lawyers Association and an attorney in the City of Industry. “Immigration law is considered the most complex area of law other than tax law,” Nieblas said. But Robin Hvidston, executive director of the anti-illegal-immigration group We the People Rising and an Upland resident, said taxpayers shouldn’t foot the bill for the migrants. “What kind of country provides legal assistance to lawbreakers when our own citizens are suffering?” she asked. Hvidston and other anti-illegal-immigration activists believe the child migrants shouldn’t be able to stay in the United States while their cases are heard. They are calling for laws on the matter to be changed, if necessary, so the government quickly returns the children to their home countries. Immigration-court judges can order the deportation of a migrant who does not show up for a hearing. About 80 percent of unaccompanied minors attended their first court hearing between July 18, 2014, and Feb. 24, 2015, according to the U.S. Executive Office for Immigration Review, which oversees immigration courts. During that time period, judges ordered the deportation of 3,902 children in absentia, which means a hearing was conducted in the child’s absence. That is out of 20,316 cases in which there was a first hearing held. Victor Nieblas, president-elect of the American Immigration Lawyers Association, said some children and their parents or guardians are not receiving the notices of court dates. Others are told to report to court in the border area where the child was apprehended, rather than near the child’s current home, he said. When Guatemalan immigrants Elva Marroquín and Angel Rosales wake up every morning, they wonder whether that will be the day they find out their children will be deported. Angel, 11, and Dulce, 8, are among the tens of thousands of Central American child migrants who last year left their violent homelands for the United States. Marroquín and Rosales are fighting in immigration court to keep their kids with them in their Rialto home. They fear the children will be killed if the U.S. government returns them to Guatemala. Across the Inland area and the nation, the parents of other migrants are immersed in similar court battles and face the same uncertainty about their children’s future. Nearly 60,000 cases involving children were filed in federal immigration court in fiscal 2014, nine times the number as in 2011, an illustration of the magnitude of the last few years’ influx of Central American kids, which peaked in 2014. The federal fiscal 2014 ended Sept. 30. Rosales, 34, has lived in the United States since he illegally crossed the border into Arizona in 2008. Marroquín, 27, crossed into Texas in 2009. The married couple intended to return to their hometown in the Guatemalan highlands, so they left Angel and Dulce with the kids’ maternal grandparents. But, they said, the increasing violence there – Marroquín’s cousin was killed last year – led them to send for their children. The three countries that were the source of most of the wave of child migrants are among the most dangerous. Honduras had the world’s highest homicide rate in 2012, according to a United Nations report released last year. El Salvador ranked fourth, Guatemala fifth. Angel and Dulce were apprehended by the Border Patrol shortly after they crossed from Mexico into Texas in June 2014, when the phenomenon of Central American children arriving en masse in the United States exploded into the national consciousness with dramatic media images from the border. A few weeks later, Murrieta received international attention when anti-illegal-immigration protesters blocked a bus carrying Central American migrants from entering a Border Patrol station there for processing. Immigration authorities sent Dulce and Angel to Rialto to live with their parents until the government decides their fate. Meanwhile, Marroquín and Rosales have been planning to apply for protection from deportation under an Obama administration program that a federal judge in February put on hold. On March 11, Marroquín and Rosales traveled to immigration court in downtown Los Angeles for the second hearing in their children’s cases. Daniel Guzman, legal-resources coordinator of Justice for Immigrants Coalition of Inland Southern California, picked them up at their Rialto home at 5:40 a.m. for the 9 a.m. hearing. Their trip in the pre-dawn darkness down I-10 took just over an hour, but they didn’t want to take the risk that an accident or traffic jam would make them late. Some judges deport children whose parents miss a hearing. “I’m a bit nervous,” Rosales said in Spanish before the hearing as he sat with a cup of coffee at a Subway restaurant near the courtroom. Marroquín sat next to him with their 18-month-old U.S.-born son Emmanuel. Across the table was Guzman, who in addition to driving the couple to court appointments explains the legal process to them and translates. Rosales said he was even more nervous in January when a U.S. Citizenship and Immigration Services official in Anaheim interviewed Angel and Dulce. The children are requesting asylum, and the official asked them questions about their lives in Guatemala. A Toronto man is facing 88 charges in connection with a months-long immigration fraud investigation. Nageshwar Rao Yendamuri, a regulated immigration consultant, was charged at the end of a 14-month investigation into his conduct, the Canada Border Services Agency said in a statement Friday. Yendamuri worked as a consultant with the Immigration Consultants of Canada Regulatory Council, the national regulatory authority designated by the Government of Canada. The ICCRC is meant to safeguard those who seek Canadian immigration advice and representation, the website says. All immigration consultants — working in Canada or abroad — who provide Canadian immigration services for a fee must be registered with the ICCRC. The CBSA said Yendamuri was arrested last week in Toronto, and is facing 44 charges under the Immigration and Refugee Protection Act for counsel misrepresentation and misrepresentation. He is also facing 44 charges under the Criminal Code for forgery and use of forged documents. Yendamuri is accused of submitting multiple immigration applications on behalf of religious workers for temporary resident visas, visitor extensions and visitor status restoration. Border agents allege he supported the documents with forged and/or fabricated documents. He is currently out on bail with a $100,000 bond and several conditions, including that he not have contact with any witnesses who will be called to testify against him, and that he not conduct any immigration-related work. The investigation is ongoing. Anyone with more information, or details on any other suspicious cross-border activity, is asked to call the CBSA at 1-888-502-9060. All calls are confidential. A campaign group is making a case for immigration in the UK, saying it is “gravely concerned” by politicians’ rhetoric on the issue. The Conservatives, Labour, Lib Dems and UKIP are all proposing tighter border controls, with a recent poll suggesting immigration was the third most important election issue behind only the NHS and the economy. It has proven a catalyst for a wider debate about Britain’s place within the European Union, with UKIP arguing that free movement of workers and a rising migrant population is putting too much pressure on public services and driving down wages by undercutting British workers. 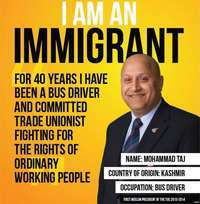 Against this background the Joint Council for the Welfare of Immigrants (JCWI) – which campaigns against discrimination – is spending £44,000 on a UK-wide poster campaign, with the aim of “humanising the debate”. “Without immigrants the NHS would collapse,” says 40-year-old S Chelvan, who arrived in the UK from Sri Lanka aged four. His parents moved him to the UK to escape riots in his home country, and his mother worked in the NHS. “As a musician I have always moved around,” says violinist Nicolette Moonen, who moved to the UK from Holland in 1992 and teaches at the Royal Academy of Music in London. In 1996 Nicolette founded The Bach Players and the group holds a regular concert series in London and has performed all over the UK. “Wherever I go my common language is music,” says the 59-year-old. And she believes immigration is an issue that the whole nation needs to address. “The dog barks at the stranger, but when the dog knows the person it wags its tail. We want to this to happen with society’s view of migrants,” she says. Mary Sithole says in the last five years she has noticed the debate around immigration become more vitriolic. “It has made me wonder if I’m really in the right country,” says the 40-year-old, who escaped from Zimbabwe in southern Africa when she was just 20 because her family feared for their lives. Lois Lau, 32, moved from Malaysia to the UK, aged 13, because her mother worked for the NHS. On 29 April she will be representing England in the international touch rugby finals in Australia. She was also part of the England team that won gold in the non-contact sport at the European championships last year. “For me people’s attitudes on immigration have not got any better than when I first arrived in the country,” she says. Saira Grant, legal and policy director for Joint Council for the Welfare of Immigrants (JCWI) says that the tone of public discussion about immigration is “contributing to a climate of hostility and fear”. Her campaign is not party political, she says, but argues it is “absolutely ridiculous” for parties to put a specific cap on net migration. The Conservatives were criticised for missing a target to reduce immigration to “tens of thousands” by May, as it rose to 298,000. Labour has said it got it wrong on immigration when last in government, failing to take into account the impact on public services and driving down wages. Meanwhile, UKIP leader Nigel Farage has said he would like to see the number of immigrants to the UK “below 50,000 a year” but says an overall cap on net migration would be “ludicrous”. From Monday 13 April, posters will go up at 400 London Tube stations, with larger posters appearing on billboards at railway stations across UK. This issue includes EU and worldwide migration, border controls and rules on work and benefits. ‘The Brothers” is a troubling book about a tragic episode in post-9/11 America: the bombing of the Boston Marathon two years ago by brothers Tamerlan and Dzhokhar Tsarnaev. The book is tragic not only because of the deaths and maimed lives, but also because of the backstory: the brothers’ difficult experience adjusting to immigrant life in America. And it’s troubling because Gessen contends that the United States was as responsible as the misguided youths for the explosions near the marathon finish line that killed three and injured more than 260. The younger, surviving brother, Dzhokhar, was convicted Wednesday on 30 counts related to the attack. Gessen, herself once a Russian-speaking teen immigrant in Boston, is well-equipped to navigate the Tsarnaevs’ story. She covered the wars in the Russian region of Chechnya, where the Tsarnaev family has its roots. Her reporting for the book took her from the Boston suburbs to locations throughout Russia. More recently, she covered Dzhokhar Tsarnaev’s trial for The Washington Post. Hers is a valuable contribution for its insights into the complicated psychological history of the Tsarnaev brothers. If we are to draw a lesson from their calamitous outcome, we need to understand the emotional path the boys took from wide-eyed immigrant children to murderers. Gessen describes the Tsarnaevs’ early immigrant days in a section aptly called “Dislocation,” with chapters titled “Love,” “Wandering” and “Dreaming of America.” These titles could easily decribe the early experiences of many immigrant families. The Tsarnaevs hoped for a better life here; they sought to escape the long, troubled history of the Chechen region, which has been riven by separatistism, Russian aggression and periods of war. In America, the Tsarnaev family — mother, father, two sons, two daughters — struggled after arriving in 2001. Gessen takes us through this dark reality in a section titled “Becoming the Bombers,” in which she chronicles “a decade of broken dreams.” Here we see the financial and psychological pressures that force some immigrants to rely on the kindness of strangers, the charity of the state and the kinship of fellow immigrants. The family found a “miracle,” Gessen writes, in a Cambridge, Mass., former Peace Corps volunteer, Joanna Herlihy, who provided the family with an apartment, introductions and a lot of patience, as the Tsarnaevs broke promises and missed rental payments. At this time, younger brother Dzhokhar was “the sweet kid, the kid everyone loves,” the author writes. Despite the assistance, the Tsarnaev family “witness[ed] the slow and catastrophic demise of a whole set of immigrant dreams,” Gessen writes. Things began to crumble as the brothers’ drug use picked up. “Pot was the scourge,” she explains. “Each member of the Tsarnaev family was descending into a separate personal hell,” Gessen writes. Media accounts have chronicled run-ins with police over alleged shoplifting, counterfeit money, marijuana possession and intent to distribute. Drawing perhaps on her own experiences, Gessen is eloquent in describing the sense of loss an immigrant feels. “You never talk about the pain of dislocation,” she writes. “You do not describe the way color drains out of everyday life when nothing is familiar, how the texture of living seems to disappear. You breathe not a word of no longer knowing who you are, where you are going, with whom, and why — and the unique existential dread of that condition. Most important, you never question your decision: from the moment you cross the border, there is only ever the future.” The result is immigrants who fail to properly mourn the lives they’ve left behind. As the daughter of Muslim immigrants from India, I understand that dynamic intimately. In 1992, when I was 26, I decided that I should marry within my culture and religion. So I left a Lutheran boyfriend from Iowa (who was a good match for me) for a Pakistani Muslim living in Washington (who was not). When I mentioned this to my boss, he gently pointed out that ill-advised actions often result from an inability to grapple with the past. In my case, I married the Pakistani Muslim, and my union lasted just a little longer than the first bethrothal of Kim Kardashian. Clearly, like many immigrants, I was struggling with how to shape my newly emerging identity. Tamerlan Tsarnaev, the older brother, and his mother, Zubeidat, may have been facing the same struggles in 2009 when they began to study the Koran, getting their lessons from “the Internet and . . . occasional intense conversations with better-informed acquaintances.” The book provides little insight into the brothers’ Muslim teachings as young children, except to say that they were not schooled in extremist thought. At this later time, however, Zubeidat started wearing a hijab, and Tamerlan showed increased devotion to his religious life. He threw away binders he’d put together when he was younger that contained clippings on how to seduce women and hypnotize people. The book has a splendid opportunity to reflect on the community’s role, particularly that of the Muslim community, in guiding young people toward positive, healthy lives. It is important to hold individuals, families and communities accountable for the development of young newcomers to America. But Gessen misses her chance to explore this crucial piece of the immigrant puzzle. Neuroscientists, psychiatrists and psychologists increasingly analyze the immigrant experience in the context of trauma. Immigrants experience not only a geographical upheaval but a severe blow to their identity. The Tsarnaev story reminds me, as a mother of a 12-year-old next-generation immigrant boy, that it is vital to promote a psychology of integration, adaptation and healing. She even asks, “Is it conceivable that the Tsarnaev brothers were not the marathon bombers?” — and answers: “Yes, it is conceivable.” Gessen contends that the FBI hatches terrorist plots as sting operations to nab possible terrorists but sometimes reels in law-abiding citizens. From Sept. 11, 2001 to 2013, Gessen writes, “the number of terrorist attacks carried out on American soil by people connected to Islamic organizations numbered zero, but trumped-up terrorist plots numbered in the dozens, and the people who went to jail because of them in the hundreds.” Gessen proposes bizarre theories for which she doesn’t provide evidence, such as one about Tamerlan possibly having been a FBI informant who went rogue. As we saw at his trial, the younger brother, Dzhokhar, didn’t assert his innocence in the marathon bombing. Before his capture, he wrote a note found bloody and bullet-ridden in a boat where he hid after the attack. “We Muslims are one body, you hurt one you hurt us all,” the note read. “I don’t like killing innocent people it is forbidden in Islam but due to said [illegible] it is allowed.” A bullet hole was responsible for the illegible word. As the Tsarnaev story shows, immigrants suffer the emotional challenges of dislocation, hardship and trauma, and sadly, these vulnerable brothers turned their struggles into terror for which there is no excuse. In an expected move that leaves the status of up to 5 million immigrants in the U.S. illegally unchanged, a federal judge in Texas refused to lift his order putting on hold President Obama’s executive action dealing with the politically charged issue. In a pair of rulings late Tuesday night, U.S. District Judge Andrew S. Hanen refused a government request to allow the Obama programs to resume while the broader issues are being litigated. A coalition of 26 states led by Texas is fighting Obama’s executive action, announced in November. The action expanded the pool of people who could receive some legal immigration standing to include the parents of U.S. citizens or legal permanent residents. Obama also wanted to increase from two years to three years the Deferred Action for Childhood Arrivals, or DACA, program, designed to help so-called Dreamers. Texas officials praised the judge’s rulings while the White House condemned it. In a statement, Texas Atty. Gen. Ken Paxton again attacked the Obama administration. Jose Palacios, 23, of Tampa, Fla., received DACA relief and his mother — who came to the United States illegally from Mexico more than 20 years ago — had hoped to apply for a similar program for parents known as DAPA before the lawsuit. Three of Palacios’ siblings have DACA status, five are citizens. Palacios said he was not surprised by the conservative South Texas judge’s ruling. “We knew his stance … what his intentions are: to continue to hurt immigrant families across the country,” Palacios told the Los Angeles Times. The Obama administration heads back into federal court before a skeptical judge here Thursday in an attempt to revive the president’s plan to shield up to 5 million people from the threat of deportation. “Sometimes my mom loses hope that anything is going to happen,” Palacios said. He said he planned to explain Tuesday’s ruling to her, adding that he would be in New Orleans next Friday to protest ahead of the 5th Circuit’s hearing on the appeal,” Round 2 of this fight. Nora Preciado, a staff attorney with the National Immigration Law Center based in Los Angeles, said she planned to attend the appeals court hearing. “This is just the first step in the legal battle,” Preciado said, adding, “We are all looking forward to the hearing on the same motion to stay at the 5th Circuit” next Friday in New Orleans. Her group submitted an amicus brief supporting the federal government to the 5th Circuit this week. Earlier this week, a panel of the 5th Circuit rejected a challenge to Obama’s 2012 executive action, upholding a lower court’s earlier ruling in a case involving Mississippi and some border agents. In the latest actions, Judge Hanen issued two orders — one refusing to lift his injunction, the other detailing what he called the federal government’s misleading statements. He ordered the government to provide more information by April 21. The judge who blocked President Obama’s executive action on immigration has ordered the Justice Department to answer allegations that the government misled him about part of the plan. At issue, lawyers for the federal government say, is confusion over a pair of Obama’s immigration actions. The Deferred Action for Parents of Americans and Lawful Permanent Residents, or DAPA, would affect more than 4 million people who have lived in the United States for at least five years and are the parents of U.S. citizens or legal permanent residents. The DAPA action also included a provision to change DACA. And this is where the confusion began. The DAPA executive action included expanded deferred action for qualified DACA applicants, from a two-year reprieve to three years. Although 26 states were suing to block DAPA, federal government lawyers allowed DACA applicants to apply for a three-year reprieve. Hanen, at times visibly angry in the hearings, wasn’t informed of the accepted applicants for weeks after the suit began and threatened to sanction the Justice Department if he found that government lawyers had misled him about the rollout of the immigration actions. “The court expects all parties, including the government of the United States, to act in a forthright manner and not hide behind deceptive representations and half-truths,” Hanen wrote Tuesday night. Hennessy-Fiske reported from Houston, Duara from Tempe, Ariz., and Muskal from Los Angeles. Times staff writer Christi Parsons in Washington, D.C., contributed to this report. An immigrant rights group is calling for an independent investigation after a Salvadoran man died while in U.S. immigration custody after months of incarceration at a privately run detention center that has been accused of medical neglect in the past. Raul Ernesto Morales-Ramos, 44, died Monday after being transferred from Adelanto Detention Center to a hospital in Palmdale, according to a statement from U.S. Immigration and Customs Enforcement. He had been in ICE custody since 2010, and was fighting extradition to El Salvador to face criminal charges, the agency said Tuesday. According to ICE, Morales-Ramos was taken to the hospital on Friday after he experienced “unusual bleeding.” Tests at the hospital indicated that he had intestinal cancer and required inpatient care and possible surgery, the statement said. Christina Fialho, an attorney who helps runs a visitation program at Adelanto, said doctors at the detention center did not do enough to help Morales-Ramos, even when he complained about worsening symptoms. “When this man asked for a catheter, medical staff at Adelanto denied him,” said Fialho, who called for an outside investigation into the death. A U.S. citizen who said he was threatened with deportation while detained in jail has settled a claim with the Los Angeles County Sheriff’s Department. ICE spokeswoman Virginia Kice said the agency’s Office of Professional Responsibility, which investigates detainee deaths, has begun an inquiry. The Los Angeles County coroner’s office is conducting an autopsy. GEO Group, the Florida-based prison company that is paid roughly $100 per detainee per day to operate the detention center, did not respond to requests for comment. The Adelanto facility has been accused of neglect in the past. In 2012, a Mexican immigrant named Fernando Dominguez died of pneumonia after being detained at Adelanto. He was one of 141 people to die in ICE custody between 2003 and 2013, according to agency data. An inspection report that year by the Department of Homeland Security said Dominguez “received an unacceptable level of medical care” at the facility, and that his death could have been prevented. A medical malpractice suit filed by his family against GEO is pending. An inspection report from 2014 found that medical care at Adelanto met the agency’s standards. Morales-Ramos was transferred to Adelanto last May after spending four years in ICE detention at two other Southern California facilities. He was arrested in 2010 after authorities in El Salvador charged him with conspiracy to commit aggravated homicide, ICE officials say. According to news reports in El Salvador, Morales-Ramos was accused of hiring a hit man to kill several relatives in his home country, allegedly so he wouldn’t have to share a multimillion-dollar settlement he won after his wife and their three children died in a California road accident. Morales-Ramos was ordered deported in August 2010, but filed multiple legal appeals seeking to block his removal, ICE said. At the time of his death, Morales had a petition for review pending before the U.S. 9th Circuit Court of Appeals. His brother, who lives in the U.S., is arranging to have his body sent back to El Salvador and is considering filing a lawsuit, according to Julio Calderon, vice consul at the Consulate General of El Salvador in Los Angeles. Lawmakers used the Tuesday morning news conference — conducted in English and Spanish — to blast Congress for failing to pass an overhaul of federal immigration laws. The most sweeping proposal would extend Medi-Cal coverage to people living in the country illegally. Lawmakers acknowledged that such an expansion of state-paid healthcare for the poor could come at significant costs, but the bill’s author, Sen. Ricardo Lara, said he was lobbying authorities in Washington for the federal government to shoulder part of the burden. The proposal’s price tag could pose a challenge to California’s delicately balanced budget. Assembly Speaker Toni Atkins (D-San Diego) acknowledged that not all of the proposals will face easy passage. Senate Republican leader Bob Huff (R-Diamond Bar), noting that his caucus supports federal immigration overhaul, said California is being overburdened by trying to act in the federal government’s place. –Change California’s civil-rights law to extend anti-discrimination protections to immigrants. –Require defense attorneys to inform their clients of the immigration consequences of certain judgments or plea deals. –Establish an Office of New Americans in the governor’s office to assist immigrants with naturalization and other services. Follow @melmason for more on California government and politics.